Today's poll was suggested by Now Smell This reader Namita, who notes that we frequently bash fruity florals around here, but that sometimes she wants something "light, and well, fruity". So, what's your favorite fruity floral? Mine is probably Parfums de Nicolaï Eau Exotique (citrus + mango + cassis + jasmine). I liked Eau Exotique as soon as I tried it, but I've since come to adore it, especially in hot weather, and I included it in my Top 10 of Summer in 2007. Someone told me recently that it was discontinued in favor of the newer (and also mango-ish) Eau Turquoise, but I haven't made any attempt to find out if it's true, and I'd probably rather not know. Beautyhabit does still carry Exotique in 30 and 100 ml. Also feel free to suggest a new lazy poll topic! Note: image is Mangoes [cropped] by Mahesh Khanna at flickr; some rights reserved. Chanel's no5 Eau Premiere is as close to fruity-floral as I can bear to sniff– I'd probably love it if I didn't already love no5 in extrait. For another lazy-day poll, how about “fragrances we love although they seem totally out of character for us”? This popped into my mind as I was commenting on Perfume Posse just a while ago, so I've suggested it there too. I think it would be fun, since I've known a few instances of people who wore scents one would think they'd hate. Hmm, I got a sample of Exotique that seems like it might have been “off”, because it was not nice. But I've really been drawn to descriptions of it and Turquoise. Add to the must sample list. I think many of us appreciate a bit of fruity floral, just not the cheap, lame ones (often celebrity). LOL. Don't worry, Namita, I'm sure NST readers will come up with a great list. My fave is another Parfums de Nicolaï: Balkis. I don't know that i'd call it light, but I'm kicking myself for not pursuing a 30ml bottle on ebay awhile back. Whenever I pull out the sample, I really love its comforting, jammy sweetness. There is apparently a “Light” version as well (see Robin's review). Will put that on my poll list, thanks! Or maybe you just hated it! I do not think it is universally loved. Does Calyx count as a fruity floral? Seems like it to my immature nose. One of my all time favorites, though I haven't worn it in years. Hmmm, maybe another one for my shopping list. Calyx is the fruity floral that first come to mind. The only one that has ever made a real impression on me. There are a quite a number of well-done fruity florals, given the abundance of fruit and flowers surely any woman can find her own. One question – does coconut count as fruit? It's a nut really isn't it? After all we have Fruit & Nut chocolate so there should be a difference between fruit and nuts. So in the Fruit & Nut category I would place all the coconut fragrances I adore, like Azuree Soleil / Bronze Goddess from Estee Lauder and Eau de Figuier Extreme from L'Artisan. How about Cirtrus & Herbs? This is a wonderful category where we can include Aqua Allegoria Herba Fresca and Mandarine Basilic, as well as all the Hermes Un Jardin collection. A favorite is Annick Goutal Les Nuits D'Hadrien although that may be more like a fruit'n'spice. From the true fruity florals a nice one that comes to mind is Dior Addict 2 with rose and grapefruit. My favorite ones are Badgley Mischka which makes me think of brandied fruits and rich bouquets, and is very exuberant. Next would be Ferre by Gianfranco Ferre (2005, Bourdon), in which the fruits are so soft and sheer it is like a veil of aromas of orchards and fresh picked fruits. Another “fruity” floral is the Givenchy Organza 2007 Jasmine Harvest which smells like ripe apricots and vanilla. And I don't even know if it would count here, but Guerlain's Nahema, which is like roses and peaches dripping in honey. I'd also like to add a non-perfume fruit – the Body Shop's Mango Body Butter is just about as mouth watering as it gets! PS – AugAmbre – Calyx does count – hello papaya! One more – Clinique Happy! that is again Citrus & Flowers. Is Mure & Musc a fruity floral? It certainly is fruity but not so sure about the flowers. I had to stop back in to say I really love that image. Makes me hungry for mango & sticky rice. I wore Calyx by the bucket in the late 80's. early 90's, as did a lot of people, it was a real crowdpleaser. I wonder if it's somehow complicit in bringing on the wave of fruity florals in the mid to late 90's? btw, I resniffed it very recently and was shocked at how much I still like it. Coconut is a fruit, although that doesn't necessarily mean that a scent w/ coconut (or any fruit) would get classified in the fruity floral family. I'll have to try that body butter! MeM is actually classified as a citrus, but that's ok, we're not being picky about the categories here. They've made it for years and it smells EXACTLY like you just peeled a mango and smeared it on your skin. Wonderful stuff. Should add: Michael Edwards classifies it as a citrus, but the French Comite Francais classifies it as a musky floral. So choose your poison. Isn't that awesome? I love flickr. Off the top of my head, I like Yuzu Rouge by 06130 and Un Zeste de Rose by Rosine. I think there are numerous good quality fruity/florals amid the myriad of poorly done fruity/florals. I am anxiously awaiting my Serge Lutens Nuit de Cellophane, which is rumored to be a high quality fruity/floral. Juicy Couture – one of my favorites. Though I don't care for the fashions, the scent is awesome. Charlotte, did you see March's recent post on the Posse about the sample set from the MDCI website? Of course you would have to order 4 other samples along with it, but you get 10 ml of each scent for 55 euro. Might tide you over until you hit the lottery jackpot. Maybe you could find a friend or two to split the sample set? Or offer those you do not want on scentsplits? Based on my very quick sniff of NdC, I'd call it a floral but not a fruity floral, although it does have fruity undertones. Fruity floral? What's that, lol? I guess one of the original “fruity florals” is Mitsouko, and I love her dearly! There was this great fruity floral from The Cross boutique in London, and it was called, interestingly enough, Fruits and Flowers. I was divine. Sort of musky and plummy and pruney and simply delicious. I mean..”It was divine.” Sorry! 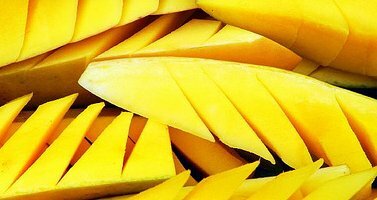 Mangos might be the only fruit I've never learned to love. Although I do think they smell better than they taste. Actually, 10 ml is not bad…Thanks for the advice, divinemama, I just might do that! Really surprised they haven't done a flanker for JC, it's so popular! I recently tried Hanae Mori Butterfly and was surprised at how much I actually liked that Big Juicy Berry opening. I don't think I'd actually wear it, mind you… not that I COULD, mind you… my teenage daughter absconded with both my 2.5 ml sample sprays. And now I must add Nahema to my TPC wishlist, Ann! Yet another rose you've made me want to try. Petite Cherie is lovely, I'd include that in my favorite FFs too. Sweet mals! My 9 yo daughter loves Petite Cherie also. It was actually my gateway scent into my latest obsession, um I mean, extreme interest in perfume. I guess the apricot in NdC is extremely subtle then. I would bother to cut so nicely either, especially if I was really hungry for lunch. I am not a big fan of fruity florals but I do like Chopard Madness, Herve Leger, Keiko Mecheri Fleurs d'Osmanthus, and Worth Courtesan. Well, it's fruitier than that, but something has to be pretty darned fruity (and usually have a correspondingly light base) to get officially classified as a FF. Didn't they just announce one awhile back? Vive La Juicy, or something like that? Any comments on Rosines that you've tried? Have you tried Cartier's So Pretty? ??? ? Okay, okay…I demure, your honor! But you have to admit it was a good try! I love that Keiko Mecheri, and very glad I finally got a bottle. First in fragrance carries a pretty complete line of PdN…at least it sure looks like it to me. And anyone who likes their stuff (like me) might want to know that Naz (the perfume shoppe) is planning to get the PdN line in her store in the next couple of months….I can hardly wait! Pretty sure that was just their 2nd scent, but not a flanker to the original JC. That's what I call a challenging poll! My choice would be Spring Flower – I like its crispy apple, strawberry and melon nuances, and my own Tamya perfume, with cassis and yuzu. Other than that, while I enjoy fruity notes (i.e. : melon and plum in Le Parfum de Therese, cantaloupe in Un Jardin Apres la Mousson) – the fruity-floral fragrance category is clearly not my personal favourite. Geurlain Insolence EdP which is gone before it even got started! Powerful yet very nice and my sample is all gone too now. I know the Fresh Index line doesn't get much love, but Pomegranate Anise is one I'll never be without. It's just the thing to perk me up when it's hot outside. I recently swapped for a partial bottle, and it leaked in transit but I didn't even care because my post office box smelled so good. Fresh better not discontinue it like they do all the good ones. I just ordered Insolence edp from Strawberry.net. It is taking forwever to get here, but the price was very good with free shipping. Other discounters are selling it, too. I wish my bottle would hurry up and arrive! Oh no! that makes me very sad to see its gone the way of the discounters! I can't believe it! it makes no sense – it's so so much better than the EDT. Thanks for the tip and I will order my bottle pronto – the AG scents I have on my wishlist will have to wait! Thanks violetnoir! My favorite is Guerlain Aqua Allegoria Pamplelune, but I also love Calyx Elixir, PdN Eau d' ete and Turquoise, Miller Harris Tangerine Vert. R, let me know if it's a must-have! Hey, I might need one of those, thanks! It really does smell nice, though the scent lingers rather too long for my taste. Still, I liked it enough to buy it a few times. Sarahn, pretty sure I've never tried that one. Sounds good! Eau d'Ete is another great scent, and I tend to forget about it even though I've got a bottle. LOL! And phew! Thank God cos I have way too many of those citrus scents! Now I know better than to call them “fruity” – bad girl – consider wrist slapped! Hmmm…I'm not sure about this. I've been investigating. I think it's hit the discounters before it's actually hit the U.S. I called Bergdorf's a few weeks ago, and they said it was backordered and they'd call me when it was in. Well, I wanted the 1.7oz – they called to say they only got the 3.4oz – did I want it? If I hadn't already spent over $100 on another scent just a week before that, I would have said YES! But I had to pass it up. Now I'm kicking myself, but it's still nowhere to be found. I've even asked at Sephora, Saks, and Nordstrom, and it's not on their lists of upcoming scents. I really wish someone had the real story on this thing. Bergdorf's said it was exclusive to U.S. Guerlain boutiques, but Saks NYC didn't have it at all and said “It's only available in France.” Anyone out there have the REAL story??? So while I am in confession mode I will admit that Dior's J'adore is appealing to me lately too. A few years ago I got it as a Christmas gift and was not impressed but lately it's been a nice alternative for the office. The plum really grew on me, it will never be a fave but it's nice. I received my sample of ParfumsMDCI Le Rivage des Syrtes/PdN1 which is Patricia de Nicolai's firstof two scents for MDCI. This is such a great scent, orange and pineapple to start before a tuberose and orange blossom heart finishes with vanilla. This is all done with an excellent balance that keeps this from being too over the top. I really think de Nicolai hit a home run here. BTW, Abigail over at I Smell Therefore I Am found it locally (I think she's in NJ?). She said she'd seen it in Nordstrom and Sephora. When I asked at my local Sephora, the SA suggested that perhaps bottles are showing up in the U.S. because people are purchasing them overseas and returning them here – she says they'll accept returns without receipts. As y'all can tell, I've been on the case. Ha ha. I got a sample vial when I was out shopping. It was either Saks or Neiman Marcus I think. I was looking for some Shalimar for my aunt for Christmas and I wanted the perfume not the EDT. The SA stuck the vial in the bag. I loved, loved it but I went to Macy's to try to get a bottle and they said nope, they had no idea when it would be available. I went to Saks to try to get one of those Guerlain compacts for Chrtistmas and I asked them too and they said they had no idea when they would be getting it in either. Very big sigh! Sorry no help but that's all I know. I started wearing Molinard Nirmala for week or so, and that prompted me to suggest this poll. I just love Nirmala. I also really want to try Calyx, based on the rave reviews it's gotten. Another note: While I hate Chanel Chance Eau Fraiche on me, I smelled it on a girl who works in my office, and I have to say it wears well on some people. Huh. Who'da thunk? mangos smell fine too bad I'm allergic! One of the first samples I got when I started here was Crazy Libellule l'Olfactive 129, which is seriously all those things we dis around here but I adored it. It just made me smile, you know? And other people loved it on me. I still don't have a FB and it's getting a little harder to find, I want to try that new one that was mentioned on here a while ago, too. That was a fruit basket in a bottle. Since citrus doesn't count I won't mention Pacifica Malibu Lemon Blossom. Since coconut doesn't count I won't mention Bronze Goddess or Harajuku Lovers G, either. Otherwise, I am kind of wanting to explore fruity floral a bit more. I know there are good ones out there, and I rather like some fruit. Avon does that nice berry in the Imari Seduction and I have a Trish McEvoy berry on my list. That Peche Cardinale sounds fab. I guess Insolence would also count, but the sandalwood vanilla base of that moves into the gourmand catagory for me. a nut is a fruit. The coconut is adapted to be able to float long distances on water for dispersal cuzzz it usually can't be dispersed by being eaten by fauna. Can't help you at all in the fruity-floral area, as I don't care for them. However, I do have a lazy poll suggestion. I'm a big fan of classic movies, and was thinking of some recent examples I saw where a female protagonist applies perfume. For example, in “Now, Voyager”, Bette Davis dabs perfume in her hair on her first evening home from Europe, when she is about to reveal her new, stylish self to family and friends. In “Leave her to Heaven”, Gene Tierney spritzes herself with scent before flinging herself down the stairs. In “Next Stop, Greenwich Village”, Ellen Greene sprays herself before leaving the apartment of the boyfriend she's just slept with. I'm sure there are plenty more examples, I've just started noticing them since becoming a perfumista. The poll is this: Pick a movie where this happens, and the perfume you think the heroine would be using. Goutal`s Eau de Charlotte! I think it`s the bit of cocoa that makes it a fav. ( I`m one who`s VERY tired of cheap fruit/candy/floral chemical soup all over the market!!!) This makes me wear the scents I like in this family of fragrance less, too….. Onward and upward for the industry, yes??? My favorite to go fragrance is Lancôme oûi! which is fruity (fresh, not overbearingly sweet) and floral (white, light flowers) with a slight musk to it. Simple but oh so nice. I always come back to this fragrance, especially in the summer months. Not tried So Pretty yet. So far I've only tried one Rosine, d'Ete — which I loved, but want to test it again in warm weather in case the fruit is too much. From reading the notes, I've got Poussiere and Zest, and maybe d'Amour on my To Test List. I actually bought SSS Velvet Rose unsniffed. Mistake. I had had some success with the light patchouli in Organza Indecence and in Hanae Mori and thought I could handle the “hint of patchouli” in it. Turns out, I can't. (The rose is great, but VR gets to drydown and I get the dry heaves.) And for some reason, Vintage Rose was a scrubber. I need to test that Nahema! I've done well with all the Guerlains I've tried so far (well, except for that odd duck Mitsouko), so it seems my skin gets along with the Guerlain base. While you're at it, throw a sample of Frederic Malle Une Rose into the TPC cart. I'm wearing it today; it's great. A friend has been swearing by that Oxo thing for a year now. I'd get one, but I buy fresh mangoes so rarely (even with a gadget to make them easier to cut up). If you enjoy berries, seriously, get a sample of the Nicolai Balkis. Sorry, I can't toot its horn enough for berry lovers. The Poussiere is nice, need to try the Zeste….totally understand about the SSS Vintage Rose—scrubber–smelled like honey, but strong, nauseatingly so…almost rancid. SSS Velvet Rose started out pretty but turned to honey as well….too much honey makes me feel ill. I think it might be the labdanum –does anyone here know if that's the strong honey scent in rose perfumes? I've put Nahema on my list as well. Speaking of lucky MDCI samples from the Posse, I recently won a sample of MDCI PdN1 (I think it doesn't have an official name yet), and it's a deliciously charming pineapple. I'm not much of a fruity gal, but I'm really enjoying it. I can't decide if I should test d'Ete b/c I normally don't like apple, but then I try to never say never….It's too bad the SSS didn't work for you, thankfully I don't have too much trouble with patch, though I'm anosmic to a lot of musks. I'm also lucky that my skin loves roses, so unless I actually don't like the way a rose scent smells, I can normally wear just about any one. What you and Daisy may not have liked also that had the “honey” quality was most likely a sweet musk. Labdanum pretty much just smells like a “dry” wood smell and gives warmth like amber does. I'm actually trying to find something that would be like a rose version of a light cologne – almost like what Mandragore does for violets. How about Patou's Colony, another fruity chypre! And here I was trying to be strictly fruity/floral…. it really is a fantastic gizmo–I buy mangoes regularly now since I know that I'll be able to easily cut/eat it. Great idea for a poll. Now would the genre be classic movies or open to any/all? Hello NST & Fuddy Duddy – I'm always toying with whether or not I should get a sample of Eau de Givenchy. It sounds so intriguing and I love L'Interdit and G III….is it very minty like some reviews say? Or is it more of a fresh white flowers semi-cologne? Any tips? I am loving jannat Baby by Memo and ginestet sauvignonne. Ormonde Jayne 's Frangipani, osmanthus and Sampaquita behave like fruity florals on me. LOVE all three. I am a fruity/ woods or chypre lover, so I tend to reach for visa by piguet, clive christain X, histoire de chypre by molinard, iles de lac by molinard… I could go on. I have never met a Latina woman who could not make a WELL CONSTRUCTED fruity floral DAZZLE. Even some of the crap smells decent on us. I second the recommendation for Nina Ricci's Nina, but I also love Pleasures Delight – which was a shock, because I don't like Pleasures. It's not an overdone, candied-fruit either. I know that everyone else hates Vera Wang's Princess, but I think that it's a nice fruity-floral. Of course, who knows how much longer I'll like it? I've already had several scents ruined for me as my nose has developed. It's weird, too – one day I'll like something, the next, I'll put it on and find it unbearable cloying. sigh. I think the poll should be open to any movie or tv program that had a strong fragrance image. When I was young a very strong impression was made on me by the Eula Varner character Cybill Shepherd plays in the Don Jonson TV version of Long Hot Summer (1985). She's dressing herself at her mirror and dabbing frag on from a beautiful stopper style bottle. She even put some behind her knee! Wow! When I was little I always wondered what kind of southern magic style floral perfume she would be wearing! I'm not even sure what I'd recommend, but it must have gardenias or tuberose in it! Maybe Carnal Flower? I remember that—she was a horrid, horrid woman—but she sure did have that 'southern seductress' thang down pat! It would have been something sultry with lots of big gardenias, some wicked musk in the base…a 'lookin for trouble' kind of perfume. You are welcome! And, I meant to say that Insolence is taking forever to arrive, not “forwever” to arrive. Geez, what's wrong with me today, I can't seem to type anything correctly. If it ever gets here I will. I don't think I will be ordering anything else from strawberry.net. I should have known better! It's based in Hong Kong! I think the only fruity floral I've ever worn is Calyx. Tomorrow I plan to stop by Macy's tho. Estee Lauder is having one of their gifts w/purchase thingys, so I'm going to get BG. I smelled it last week when I purchsed some more Sensuous and I've been thinking about it – a lot. I'm going to get the shimmery lotion. Is Daisy a FF? I love that on my daughter. Sparkling light spring floral, not very minty, no, and not overly fruity either. It's a pretty scent — no need to make it a “confession”! Sounds lovely, look forward to trying it! I like Chance Eau Fraiche much better than the regular. If you like it, you might also try D&G Light Blue — they're very much related. Some of the first fruity florals (late eighties), at the beginning of the trend, weren't bad, “abstract” I'd guess you'd call them; the fruit didn't whack you over the head. Byblos was one, and Missoni Acqua was similar. They came out at about the same time as Calyx, which I also appreciated. My favorite recent fruity floral is Frangipani by Ormonde Jayne; early on it reminds me of guava. Don't know if it actually is a fruity floral, but Le parfum de Thérèse is definitely my choice. And the last weeks of winter mean that I'm going to use it a lot of it until at least september. Looking forward to sniff Delrae Emotonnelle, though. My Insolence seemed closer to a fruity floral to me, but Osmoz calls the original Insolence one as well. Michael Edwards calls it a floriental though. Who knows. ooh, this sounds like a fun lazy poll to me! I'll save my guess for Charlotte in case Robin ever decides to run this one. By george, I've got it! Byredo Pulp! Smells like juicy citurs, figs, sugar cane, and a dash of coconut. I love it, even if no one else does. IDEA FOR LAZY DAY POLL: favorite fragrance(s) bought UNSNIFFED based on a blog post or critic review. I LOVE Soleil by Fragonard. I also like Clinique Happy, Byblos and Lancôme O Oui. Cassis Rose from The Body Shop is very nice, too. I need to get some, but isn't that a fruity fruital? Where's the floral? Patty, thanks — sounds like a fun poll! Calyx is a MUST have in anyone's arsenal. One of the greats. You will not be sorry spending your money on this one! A love affair at first sniff! I thought Pleasures Delight (and the original Pleasures, for that matter) was really well done. Not sure if this one is a true fruity floral or just a fruity fruity, but to me Badgley Mischka edp is what I reach for when I need fruit. Its lovely and not tooo tooo. PdT is another fruity chypre. Great scent, whatever you call it. Fruity fruital, LOL! Whatever it is, it's great stuff. I've never smelled that Fragonard! i love that mango splitter! problem is that it only works with the smaller yellow mangoes, not the larger ones. otherwise, it's wonderful! How about Ormonde Jayne Osmanthus? I believe LT&TS call it (heretically!) a pleasant fruity floral that doesn't have much to do with Osmanthus. PdT is a chypre? Must try it! Ok since you been there and done that… another idea- Which Perfumer should start their own house and not work for any other brand or a large company. OR which Renowned or crtically acclaimed scent literally made you gag… and still does. Second Yuzu Rouge. I am a northwest girl and it reminds me of the scent of salmonberries. Joe/Robin — I would KILL for Balkis Light. Have either of you seen it online anywhere? Robin, this is entirely your fault, as you sent me the sample! Well, I don't love too many fruity florals (I don't eat a lot of fruit, either, though that wonderful mango photo sure grabbed me!). I do like the warmth of orange and apricot in fragrances like Osmanthe Yunnan and TDC Osmanthus, but those seem like they fit best into the straight “floral” category. And no one has mentioned figs. I love Philosykos and Premier Figuier. But wait – those aren't florals, are they? I can think of two true (?) fruity florals that I like quite a bit. Mauboussin and Keiko Mecheri's Ume are two plummy concoctions that I like for their concentrated not-too-sweet fruitiness. A, I really love that scent, but they're not alone — it doesn't seem to have nearly so many fans as the others in the OJ line. Ok with me, I love it, and it's one of those perfumes that seriously improves with age. My bottle is about 2 years old, & perfect. Yes, fruity & melony & leathery. Great stuff. It's not a question of where he grips it. It's a simple question of weight ratios…. … but I LOVE all the suggestions. Mwah! Your budget? what about MY budget?? My budget has died, been buried AND has rolled over in its grave…several times!! Yeah, and I just bought a bottle of Calyx….momentary lemming madness…want a bit? The Imari Seduction is plum, purple orchid, and vanilla, but I think purple orchid is probably a made-up flower smell. I think you guys pegged it as a fruity oriental. You are right about the McEvoy – it is berry vanilla. The Peche Cardinale has peach and tuberose – wouldn't a fruity floral be fruit and flowers? Am I missing part of the description? This one sounds like it could make you faint. Joe, Balkis is on the list! My all-time favourite fruity floral is Dalissime, which is discontinued but can still be had at the discounters (Imagination Perfumery has it for a steal). Cheerful peach and apricot (and some other stuff, including, I think, cantaloupe) mixed with rose and jasmine, with a warm oriental finish of amber, vanilla and sandalwood. Luscious. Restores the once-good name of the now deservedly maligned fruity floral category. Gosh, I only know how sublime it is because you and Robin claim that it's so… darn you both. Maybe you could write them in Paris and see if there's any to be had. Even the regular Balkis doesn't appear on the PdN site anymore, so who knows if even that is dc'd. Hmm, I love fruity florals orat least they suit me, but the only one Ican smell directly when I see the pic is YSL In Love Again. It has been discontinued twice now, but I loved it. Also Coco Mlle is a fruity-floral to me. I think it is very nice but somehow boring, but men love it. Or, let's say, my man loves it on me. Is Chasse aux Papillons Extreme not also a fuity-floral? It is and remains my all-time fave, I would give everything else away but not that. I wait for more! I need more papaya and mango florals. Passiflore from KM was very weak, ist there more similar stuff which rates less/around 100$? On Saturday I will got for a sniff-trip “to town” so I badyl need some hints! I don't know why none of the Light scents are online. I understand they're very reasonably priced…maybe it isn't worth selling them online? I wish I even knew what the rest of them were, I only know she has light versions of many of the stronger scents. For that matter, I don't really know that they still make them! I'm no help at all. Umm fruity florals….. what about Miss Dior Mon Cherie, Light Blue and the Ralph fragrances, DKNY apple? Does anyone remember a fragrance from many years ago called Molly Parness? I was sooooo fruity! Mybeautyblog, La Chasse & La Chasse Extreme are both classified as florals. Coco Mlle is a fruity oriental. You should, Soleil is really lovely. Hm, I treid 2 of the PdNs and I both did not like them. I love DKNY Be Delicious, too – I was going to put it in, but wasn't sure if it was a fruity-floral or the previously mentioned fruity-fruital. I don't get much floral from it, but that could just be me. Never heard of the Molly Parness! How about Annick Goutal Folavril for mango then? This might be one scent we would share. It's really nice. I don't watch series TV, so my vote is for classic movies. Maybe there could be another poll for TV shows. And it would have to be time-specific: i.e., “Leave Her to Heaven” was made in 1945 (the book was published in 1944), so you couldn't select a fragrance that was launched later than that. Sigh…I give up! Guess my all time favorite fruity floral is Calyx. uh-oh you're scaring me! I already bought it…you're my evil scent twin so I expected you to say something like: acck, too floral and fruity! It's a fruity floral. And you know “fruity fruital” isn't a real category, right? Hope we didn't confuse anybody. I like Peau de Peche. Wish KM was more reasonably priced. And adding: hope it was a fun vacation! I need one myself. I recieved a scented card of Vive La Juicy at Macy's when they debuted it, which I used to scent my car. I quite enjoyed it! For fruity florals, my favorite is L'Artisan Premier Figuer Extreme. The florals are much more pronounced than other fig perfumes, but there's a wonderful balance between the elements. Il Bacio (the kiss) by Borghese is a nice fruity floral, too. So are EL Pure White Linen and PWL Light Breeze. We all need a personal shopper who will hit the PdN boutique in Paris for us. I normally eschew the fruity florals, but I find these well done. best vacation i can remember, thanks! maybe i needed it more than ever! I put Imari Seduction on for bed last night and it is basically their rip-off of an Angel-esque kind of thing but more plummy. So not a fruity floral for sure. Would MaDame be a fruity floral? Still waiting on a sample of that one. Paiche Passiflore – I had to look it up – it sounds intriguing. That is an odd line and I do really well with some and really badly with some. SORRY! Fraiche Passiflore!! I had peach on my brain. 355 days of the year, it is too fruity and floral! But it's just right for those warmer days in SF, (about 10 or so days yearly). It is a wonderful scent despite the fact I love dry chypres! Of course, management's opinion is…. meh. He loves Mitsuoko. It would be funny if it caught on though and people started talking about fruity-fruitals. I guess I need to pay more attention to Be Delicious then and see if I can pick up the floral part. It just smells like apples to me. I never tried that Borghese. Or any Borghese! It's the same scent as last year. Yes! It needs to be in the perfumista vocabulary. Soleil is a nice sunny white flowers – very light. It is nothing like the Grain de Soleil, which is a floral rice pudding cinnamon comfort scent. It's easy to get them mixed up! I always get so confused about the “modern chypre” – they always just smell like an oriental to me….Oops. I had no idea about BM either. It is my favorite “fruit”. I hate the very idea of “modern chypre”. Oh well. And no worries on the BM, almost everything recommended here is not really a fruity floral, which confirms my thought that NST readers don't love fruity florals. Oh, I might need GdS then! I've never sniffed Mitsuoko–is it what Robin refers to as a 'difficult' scent? If a sample fell in my lap iI'd give it a try but I'm not tripping over my feet to get to a sniff…snf yet it's probably one of those things that everyone should sniff once. Well, it's got personality that's for sure. If you've never worn it, I say give it a try, preferably in EDP or Extrait. To me Mitsuoko is not difficult. It seems to meld with my skin and become very soft and powdery/woodsy, lasts about 8 hours. It's ok to appreciate it in theory! I demand credit. And royalties when LT/TS start using it in their books. HA! I like Comptoir Sud Pacifique Vanille Abricot. Every now and then I like to layer it with Chanel No. 19. So, I purchased the Bronze Goddess lotion yesterday and it's quite scrumptious. I put it on before bed last night and I can still smell a hint of it. For some reason tho I thought the lotion had some shimmer to it, which it doesn't. I think I can use this lotion along with Secret Obsession. LOL — good luck with that. Surprised at how few mentions CSP got in this poll! You know, I never did try the lotion — I'll have to do that. I love the new Visa too. It has a weird ripe fizz I find addictive. Rose Ikebana: crouching grapefruit, hidden rose. Idea for a poll: least long-lasting scents. Like Bois D'Iris. Just to warn people. True. Just checked, Michael Edwards calls VA a fresh fruity oriental. I realize this post is way late, but I forgot one of my all-time favorite fruity/florals- Amazone by Hermes. It's one of those oldies but goodies at the back of my closet…..
Lol! I do know what you mean. I'm almost sorry I went digging around in there yesterday…..
also: just purchased the Ruby Guava solid perfume from Pacifica – it is juicy, tart and luscious!